White Bear Lake glistens maybe thirty yards from the front door of NewStudio's original office space. The connection to nature here is a constant theme, evident throughout the office design. Authenticity, expressed in natural materials, resonates with the staff. Perhaps most striking is the live plant wall at the front entrance. Inspired by gabion rock walls often used within the construction field, the NewStudio team created a barrier to separate the lobby from the work space. Using rocks, plants, and wood within the typical modularity of a gabion wall allowed the designers to play with the relationship between solid and void. Importantly, the design still provided beautiful views of the lake to be seen from the rear of the office. Thomas Oliphant collaborated with NewStudio on the successful solution for the lobby. 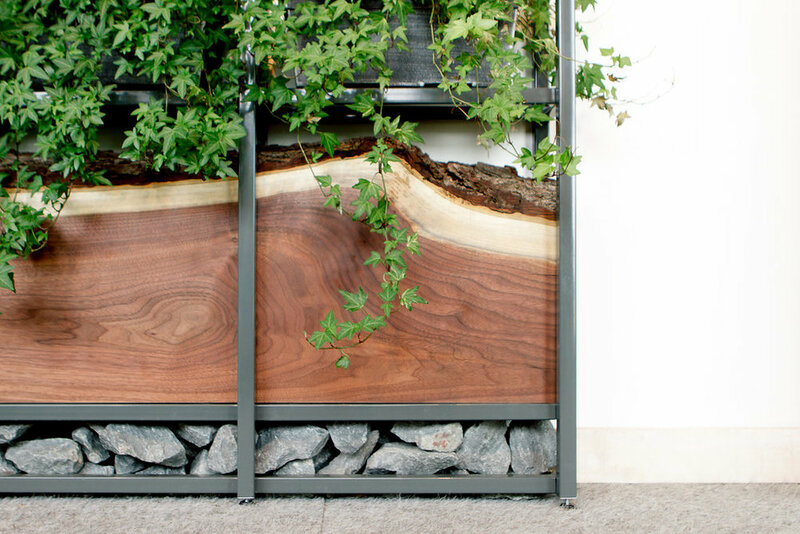 The live edge wood slab came from Scott Albright at Reincarnate Woodworking and the fabrication of the gabion wall was through Hans Early-Nelson at Primitive Precision.